Thank you! So glad you’re here!! Mercury tests conducted on vaccines at the Natural News Forensic Food Lab using high-end laboratory instrumentation have revealed a shockingly high level of toxic mercury in an influenza vaccine (flu shot) made by GlaxoSmithKline (lot #9H2GX). Tests conducted document mercury in the Flulaval vaccine at a shocking 51 parts per million, or over 25,000 times higher than the maximum contaminant level of inorganic mercury in drinking water set by the EPA. The tests were conducted by the Health Ranger via ICP-MS using a 4-point mercury calibration curve for accuracy. The concentration of mercury found in this GSK flu shot was 100 times higher than the highest level of mercury ever tested in contaminated fish, still vaccines are injected directly into the body, making them many times more toxic than anything ingested orally. (2) (3) In fact, mercury consumed orally is easily blocked by eating common foods like strawberries or peanut butter, both of which bind with and capture about 90% of dietary mercury, according to REAL science researched by the Health Ranger, Mike Adams. The influenza inoculation is administered to try to help people become temporarily immune to specific influenzaviruses that change completely and unpredictably from season to season, region to region, and from year to year. 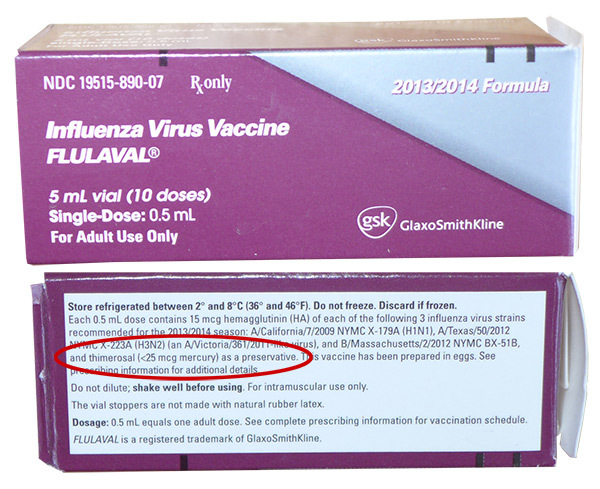 Popular influenza vaccines like Fluzone, FluLaval andFluvirin all contain the known neurotoxin mercury. 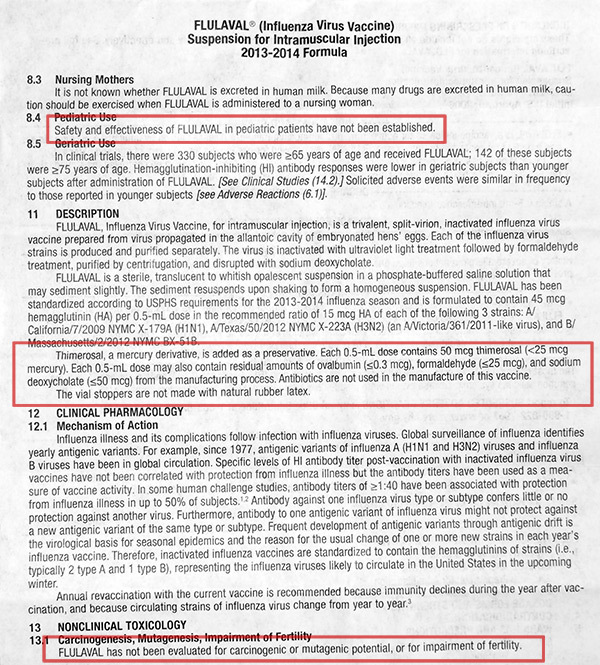 Some flu shot brochures go so far as to promote the flu vaccines by writing that “… the viruses in the flu shot are killed (inactivated), so you cannot get the flu from a flu shot.” Clearly, the diction contradicts itself by saying first that the virus is “killed” and then putting the word “inactivated” right next to that in parenthesis, which does NOT mean killed, it means the virus is “deadened” or “weakened” or simply “deactivated” because they suspend it using formaldehyde. A virus can lay dormant, trapped in the intramuscular tissue in which it was injected. Meanwhile, the human immune system can panic (fight or flight) trying to look for the invading pathogens. This is where the medical community and the CDC convince hundreds-of-millions of people to accept the theory that when your body recognizes the virus and other pathogens, it will rush to create antibodies to destroy it and then you will be immune; however,formaldehyde is a pickling CHEMICAL used to preserve cadavers and is highly toxic to the nervous system. Injecting formaldehyde into the body (intramuscular injections) can cause blindness, brain damage and seizures, not to mention cancer. (1)Formaldehyde is ranked one of the most hazardous compounds to human health and can cause liver damage, gastrointestinal issues, reproductive deformation, and respiratory distress. Plus, formaldehyde has been known to fail to deactivate the virus the vaccine is intended to prevent, thus enabling a live virus to enter your blood and infect your system–and then there’s deadly mercury and even aluminum for the central nervous system and brain with which to contend. Aluminum: 0.4 ppm Arsenic: zero Cadmium: zero Lead: zero Mercury: 51 ppm (that’s parts per million, not billion) The U.S. Department of Health and Human Services (DHHS) openly admits that formaldehyde causes cancer. You can see this yourself on the National Toxicology Program website, featuring its (12th) Report on Carcinogens. Formaldehyde can also cause myeloid leukemia and rare cancers–including sinonasal and nasopharyngeal cancer. Formaldehyde is another reason why you may get SICK from the flu shot, and that’s why doctors and nurses warn you about feeling weak and sick, but they don’t tell you it could be from the mercury, aluminum or formaldehyde, even though formaldehyde is listed on most flu shot and vaccine inserts (which most people never read even once). Formaldehyde is highly toxic to ALL animals, regardless of method of intake, whether eaten or injected. The CDC recommends EVERYONE six months and older should get a flu shot EVERY FALL and this includes PREGNANT WOMEN. Why would the CDC, the Center for Disease Control and Prevention, recommend people receive muscular injections of Thimerosal, the popular drug stabilizer that contains the compound ethyl mercury–a known neurotoxin–over and over, year after year? And why would the CDC recommend it for pregnant women but not children under 6 months of age? Certainly the child in the womb is getting the same neurotoxins as being injected into the muscle tissue of the mother who is carrying him or her. Where’s the logic? Where are THOSE safety studies and comparisons and warnings and statistics? The CDC and “Patient First” medical centers recommend that everyone get a flu shot every year and they say this is because each spring the strains of flu are “adjusted” to the most “anticipated” viral strains, and because everyone’s immunity from the previous flu shot has “declined” and may not protect you from “getting sick” the next “flu” season. The flu can be spread by the person inoculated with the flu shot for up to two weeks, according to independent research. Those inoculated carriers are then called “shedders” (4) because they may not even come down with the flu but they shed it’s contagions for others around them to pick up, usually through an orifice/passages like the nose, mouth or eyes via coughing, sneezing or sharing foods and beverages. One common side effect of getting the flu shot is getting sick. The chemical adjuvants and the virus itself can break down the immune system and cause headaches, extreme tiredness, muscle aches, diarrhea, vomiting and shortness of breath, to name a few. Then, if you’ve already come down with something else and don’t know it, or you’re suffering or about to suffer from an asthma attack or you’re borderline diabetic, you could suffer a worse fate. People carrying the flu are sick for ONE DAY BEFORE getting symptoms and then for another week after getting sick. Plus, the flu shot can worsen any chronic medical conditions from which a person is suffering, including congestive heart failure and diabetes. The flu shot is a money-making scheme invented by “Big Pharma” using fear tactics and massive advertising. What other “science-based” medicine does the US government give out and push absolutely for FREE? Why? They have never proved to any person, scientist, panel, judge or jury that influenza vaccines even work at all, ever. The flu shot vaccine inserts openly admit there is no scientific evidence demonstrating flu shots work. The flu shot is based on pseudo-science. The market draws the “bull’s eye” (the scared consumer) and the CDC draws a target around the bull’s eye (advertisements for free flu shots everywhere), and at least 200,000,000 of the 300,000,000 Americans roll up their sleeves for the toxic jab of mercury as thimerosal, mixed with “deactivated” influenza virus that makes you MORE susceptible coming down with the flu and having adverse reactions to the mercury and aluminum intramuscular inoculation. The same insert also says, “FLULAVAL has not been evaluated for carcinogenic or mutagenic potential, or for impairment of fertility.” Why not? Does it cost more to research this or more for the people who suffer this because they don’t know that mercury and formaldehyde intramuscular injections cause infertility and cancer because they’ve never read the vaccine insert, for any vaccine, not influenza, MMR, DTAP, Swine, Polio, or Small Pox. They tell you on the insert that each dose may also contain residual amounts of formaldehyde from the manufacturing process. Eye pain and chest pain • Arthritis • Dizziness, tremors and losing consciousness (syncope) • Convulsions and seizures • Gullain-Barre Syndrome • Cranial nerve paralysis or limb paralysis • Swelling of the brain • Partial facial paralysis • Blood and Lymphatic System Disorders: Lymphadenopathy. • Eye Disorders: Eye pain, photophobia. • Gastrointestinal Disorders: Dysphagia. • General Disorders and Administration Site Conditions: Chest pain, injection site inflammation, asthenia, injection site rash, abnormal gait, injection site bruising, injection site sterile abscess. • Immune System Disorders: Allergic reactions including anaphylaxis, angioedema. • Infections and Infestations: Rhinitis, laryngitis, cellulitis. • Musculoskeletal and Connective Tissue Disorders: Muscle weakness, arthritis. • Nervous System Disorders: Dizziness, paresthesia, hypoesthesia, hypokinesia, tremor, somnolence, syncope, Guillain-Barre syndrome, convulsions/seizures, facial or cranial nerve paralysis, encephalopathy, limb paralysis. • Psychiatric Disorders: Insomnia. • Respiratory, Thoracic, and Mediastinal Disorders: Dyspnea, dysphonia, bronchospasm, throat tightness. • Skin and Subcutaneous Tissue Disorders: Urticaria, pruritus, sweating. • Vascular Disorders: Flushing, pallor. 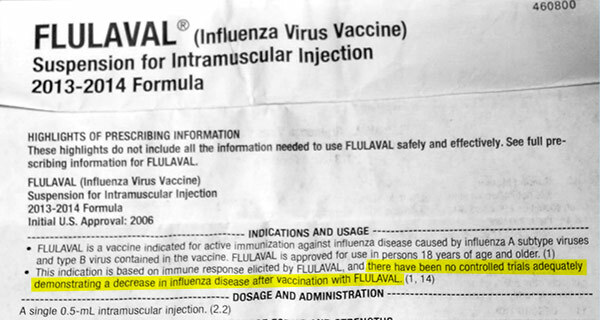 Here is the most insane part of the advice and recommendation ever given for flu shots: “Do not administer Flulaval to anyone… following previous administration of any influenza vaccine.” This means that once you get ONE flu shot, any time in your life, you should never get another shot because you previously had one, yet the commercials and the network news channels and affiliates and the doc-in-the-boxes all tell you to get that flu shot every flu season, even when they themselves admit they guessed the wrong strain! Sometimes the CDC, the Feds and Child Protective Services will step in and take the children, force vaccinate, and sell them on the foster market. It’s not too far from the current insanity of U.S. Planned Parenthood dealing abortion babies for cash on the black market (10). In the case of the Washington force-vaccination of the flu shots, another US medical kidnapping of a foster infant may be just a step away. Click here to read a recent list of medical kidnappings happening in America, more than a few of which are over vaccine issues. Big Pharma and their corrupted bureaucrats like to make their statement and set an example for the rest of America that tries to buck the toxic system. (11) It’s no wonder we still don’t believe in bloodletting and sacrificing firstborn sons to appease the gods. The truth is today, modern medicine follows similar patterns, demanding families sacrifice their health in the name of chemical injections or chemical chemotherapy that actually causes new cancer to develop. Flu shot vaccine inserts openly admit there is no evidence that flu shots work. 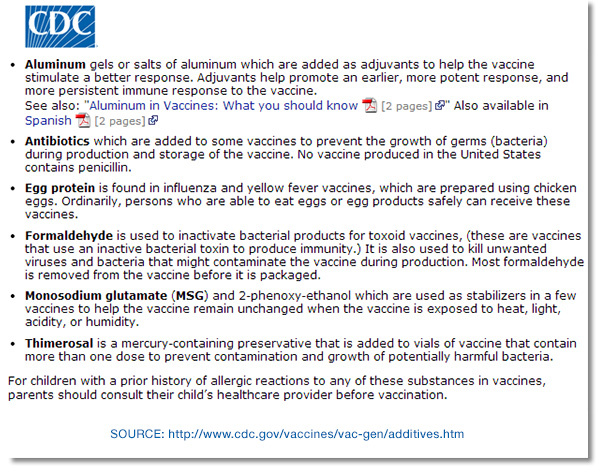 • Flu shots still contain toxic mercury, a potent neurotoxin. 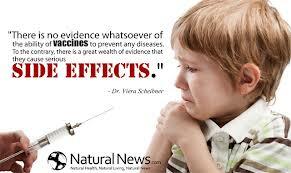 • Flu shot vaccine inserts openly admit flu shots caused seizures, paralysis and other neurological disorders. • Anyone who discusses, questions, publishes or cites the printed vaccine insert is condemned as “anti-science.” • The CDC has altered vaccine safety data to hide from the public the truthful facts about vaccine risks. • Informed parents who consciously choose to avoid having their children injected with medically useless (and dangerous) vaccines are increasingly criminalized while their children are subjected to medical kidnapping. As per the CDC website and most vaccine inserts (that most people never read), and per the independent lab tests run by the Health Ranger Mike Adams, it is a scientifically-validated FACT that neurotoxic mercury exists at very HIGH CONCENTRATIONS(9), not low per the myth, in vaccines, including the influenza vaccines so common across America today. 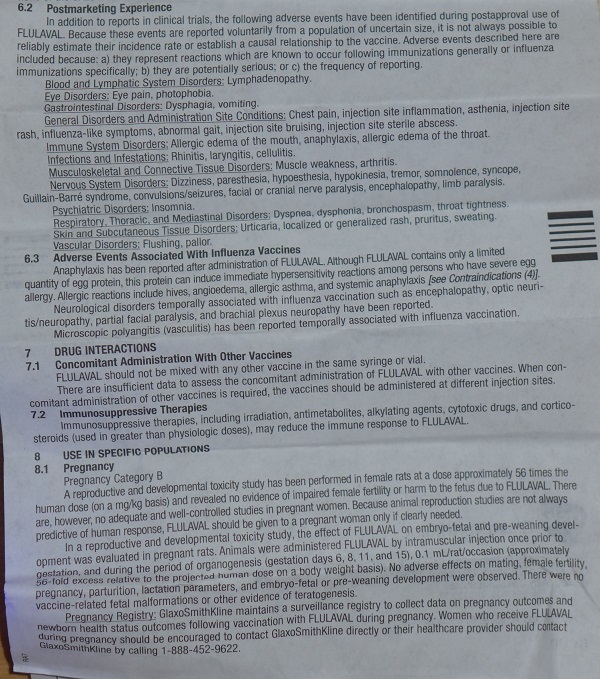 In other words, knowing that most people do not read vaccine inserts ever, doctor and nurses alike do not warn anyone about the risks of intramuscular injections, and the flu shots are dished out like candy and administered at nearly every CVS, RiteAid, and pharmacist available–even Walmart dispenses them. If they say the mercury has been removed, they’re lying. Still, flu shots are heavily propagandized and promoted with the implication that they have zero risks while offering 100% protection. Yet, according to the DOJ’s report on the National Vaccine Injury Compensation Program — which settles vaccine injury claims since the drug makers were made legally blameless by Congress — over half the compensatory claims handled between May and August of 2013 were for adverse reactions to flu vaccines, including Guillain-Barré Syndrome, myelopathy and radiculopathy; psoriasis and psoriatic arthritis; chronic inflammatory demyelinating polyneuropathy; skin rash, fatigue, and scarring; brachial neuritis; shoulder injury related to vaccine administration, autoimmune demyelinating condition, bursitis, Bell’s palsy and urticaria/angioedema; bilateral brachial neuritis; meningoencephalitis and optic neuritis; transverse myelitis, serum sickness and pain amplification syndrome of childhood/fibromyalgia; acute disseminated encephalomyelitis; rheumatoid arthritis; significant aggravation of an underlying COPD and other pulmonary conditions, and death, if you can even count death as a side-effect. Dr. William Thompson (12), after ten years of guilt and angst, confessed to a very high level of fraud going on inside the CDC regarding the results of testing where mercury in the MMR vaccines showed direct correlation to causing autism in young boys, especially African Americans under age three. Dr. Thompson says other scientists ignored results and statistics and buried them since back in 2002 and 2004. Knowing that mercury as thimerosal and formaldehyde is prominent in flu shots is very disconcerting, given the scientific proof and the ignorance of this fact for hundreds of millions of Americans, especially parents of children, infants and women with babies in their womb who are told by the CDC to get the flu shot anyway. Deepest gratitude to you folks! In 2012, then California Assemblyman Dr. Richard Pan (D-Sacramento)1assured Californians that a bill he sponsored (AB2107) to increase child vaccination rates in the state would not remove parental rights to make vaccine choices for their children. The bill would make it virtually impossible for California children to attend daycare or get a school education without receiving more than 40 doses of 10 federally recommended vaccines or filing a medical vaccine exemption granted by a medical doctor. That’s right; unless you vaccinate your child, he or she will be denied a school education from preschool through college. You’ll have no option but to homeschool. And, it sounds like Dr. Pan is not going to be content with preventing children from getting an education but is also going to lobby to deny employment to adults unwilling to comply with federal vaccine recommendations. How can this occur in America, “land of the free”? It is with a shudder I realize that my satirical April Fool’s article, “US Government Rolls Out Mandatory Adult Vaccination and Tracking Program“, is becoming more frighteningly real with each passing day. Many of my readers were outraged after reading that satire piece. They didn’t realize it was a joke until they read my disclaimer at the end of the article because it hit so close to the truth. That really says something about the growing discomfort with and deteriorating faith in oppressive and ineffective public health policies and laws. If SB277 passes, I believe California will experience a traumatic backlash, as parents will have no recourse but to shrug and comply, or flee like refugees to states where some semblance of medical choice and parental rights still exist. “The right of the State to tell us what to do to our bodies and the bodies of our children ends where our right to protect our lives and our children’s lives begins. No liability-free doctor inside or outside of government should be given the power to punish us if we choose not to play vaccine roulette with liability-free vaccines. We believe every life is important. We will not look the other way while those of us vulnerable to vaccine injury and death are being sacrificed in the name of the greater good.